Some of the girls involved in a previous programme wait their turn during a session. February at the Berbice High School ground beginning at 9:00AM and ending at 5:00PM. 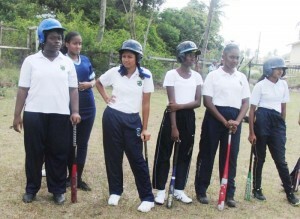 Following the GBL coaching education programme in November 2015, a group of coaches started a girls baseball programme at Berbice High School ground, the programme has been an instant success and has led to the formulation of the Kanima 21U programme to give opportunity to young women through the sport of baseball, the opportunity to play a sport and benefit from a healthy lifestyle, to build bonds of friendship that will last their entire lives and to provide an experience that changes their perspectives, broaden their horizons and fires the imagination to all the possibilities the world of sport has to offer. Fifty five girls are expected to attend this clinic which will be managed by Miss Onefa George. Fourteen other coaches will assist in delivering a programme tailored to suit four categories of players, Beginner, Intermediate, Advanced and Elite.